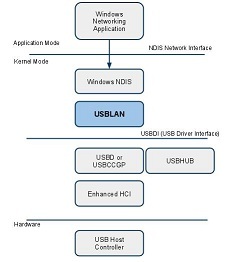 Belcarra's USBLAN for Windows USB Class Driver (host) is our recommended alternative to RNDIS for networking over USB with an Android device . Simply ensure the USB Gadget Support is correctly configured to use g_ether and ensure RNDIS is not enabled. To use Belcarra's demo version of USBLAN on your Windows host system (available from Windows Update) setup the device to use 15EC for the Vendor ID and D001 Product ID. The current rev of the Gingerbread project uses Version 2.6.32 of the Linux kernel. This version contains EEM support with a small (but fatal) bug which we have already documented in earlier work. The Android kernel is patched to disable EEM even if the EEM option is selected. By this it is meant the module parameter use_eem defaults to 0 (it defaults to 1 in other kernels). Since modules are not used much (see below), this means that EEM is not readily available. However, for test purposes, we fixed the EEM bug and changed the default value of the use_eem parameter. To do our tests, we disabled the Android gadget and enabled the g_ether gadget with and without the EEM option. NOTE: a patch is available for our customers to use to make EEM work. EEM is available in the same way as ECM in Android/Gingerbread (but buggy - readily patched). The gadget EEM does not fully exploit EEM’s capabilities. NCM is not readily available in Android/Gingerbread because Gingerbread is based on the Linux 2.6.32 kernel and g_ncm was introduced in the 2.6.38 Linux kernel. However, this bare-bones NCM gadget can be readily backported..